We would like to announce our new official name: CAVCOE. Since the founding of the company, we have used "Canadian Automated Vehicle Centre of Excellence". We knew that this was a mouthful and we have generally referred to ourselves as "CAVCOE" -- as have others. CAVCOE is now our official name. Keith Fagan, a Senior Associate, has slightly modified our logo, including removing the signpost frame. We recently prepared a chart that shows the many Canadian AV/CV tests and pilots, past present and future. This shows the significant level of activity in this space. Calgary: AV shuttle (Zoo - Telus Spark Science Centre. As we reported in last month's issue, Unmanned Systems Canada (USC) has announced the launch of Canada's inaugural national Unmanned Ground Vehicle (UGV) Student Competition. The objective of the competition is for student teams to design and build a scale model version of an automated snow plow during the 2018-19 academic year. Qualifying teams will be invited to ‘face off’ against each other during an intense 2-day competition to be held in May 2019 in Ottawa. For USC's full announcement, please click here. Many organizations around the world are developing or modifying their regulations to accommodate AV deployment in their respective jurisdiction. 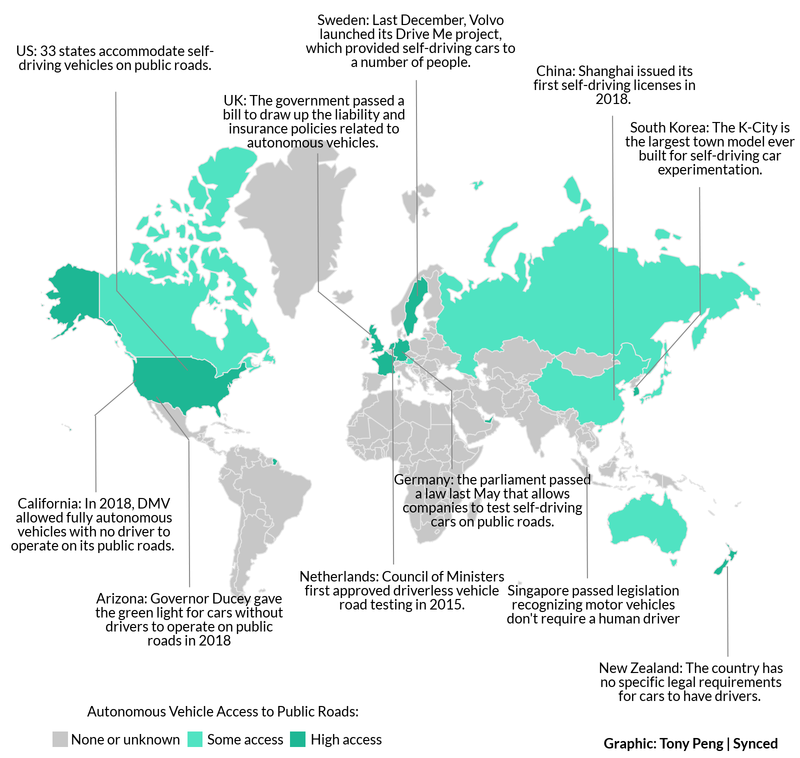 A new report by Synced titled Global Survey of Autonomous Vehicle Regulations consolidates what various countries are doing to facilitate this part of the AV ecosystem. More information is available in the Synced article at this link. A key take-away from this graphic is that Canada needs to do more to promote what it is doing. On June 28th, Transport Canada published a document titled Testing Highly Automated Vehicles in Canada: Guidelines for Trial Organizations. This guideline was developed in collaboration with the Canadian Council of Motor Transport Administrators (CCMTA). This is an important development in the Canadian AV/CV landscape and lays out the essential steps stakeholders need to follow to allow testing of AVs. Details are on the Transport Canada site at this link. On July 10th, the City of Toronto’s Public Works and Infrastructure Committee passed a motion to receive funding from Transport Canada for an automated shuttle demonstration project to be conducted in conjunction with the Toronto Transit Commission and Metrolinx. The motion now goes to the City of Toronto's full Council. Details are at this link. The Transport Canada funding is from their Program to Advance Connectivity and Automation in the Transportation System (ACATS). Canada’s Department of National Defence’s Innovation for Defence Excellence and Security (IDEaS) program will be issuing a second call for submissions for research proposals in Autonomous Systems. IDEaS is similar to the U.S. military’s DARPA in terms of seeking technological innovations with applications in the military/defence area. It plans to invest $1.6 Billion in innovations for defence and security over the next 20 years. For more information, check this link. Volkswagen, Nvidia, Continental, Ethernet technology specialist Aquantia and Bosch have teamed up to create Networking for Autonomous Vehicles (NAV). This alliance intends to develop next generation in-vehicle multi-gig networking for future vehicles and AVs. More information at this link. On May 1, 2018, voters in Nashville TN rejected plans to spend US$5.2 billion on new transit infrastructure (LRT, BRT, transit centres, etc.). The emergence of AVs was cited as part of the reason for the 2 to 1 vote against conventional transit. More details at this link. Uber, Waymo, Ford, Toyota, Daimler, Lyft, FedEx, the American Trucking Association and others are collaborating to study the 'human impact' of self-driving cars with a focus on exploring labour issues such as job losses when AVs start taking market share from human drivers. The non-profit organization for this task is called ‘Partnership for Transportation Innovation and Opportunity’ (PTIO). More information at this link. The Alberta Motor Transport Association (AMTA) is developing a new 7-acre training/test facility near Edmonton International Airport. This facility has the potential to support transportation research including the testing of autonomous trucks, driverless trucks and truck platooning. More information at this link. Waymo has announced a partnership with Walmart and DDR in Metro Phoenix to launch a commercial AV service later this year. Currently, the partnerships provide benefits to Walmart shoppers and visitors to a DDR Mall complex. If such partnerships with retailers goes nationwide as the Waymo service expands, this has interesting implications for city transportation and planning departments, for businesses, and possibly even for City Councils and regulations and bylaws. CAVCOE's Paul Godsmark has called on academics, businesses and government to support and carry out research in Phoenix to better understand the wider socio-economic impacts. All cities in North America and beyond that anticipate the deployment of shared AV fleets would benefit from such research. This could cover topics such as impacts to quality of life, accessibility (especially for the disabled and seniors), traffic, parking, business sectors, healthcare, school attendance, and emissions. Details here. A recent edition of TruckWest, Western Canada’s trucking newspaper, includes an article on autonomous friendly corridors (AFCs) and how they might evolve and benefit trucking in the region. Paul Godsmark comments on some of the opportunities and challenges that autonomous trucks and an AFC might pose. Daimler/Mercedes has announced plans to launch an AV shuttle service somewhere in Silicon Valley in 2019. The shuttles will be luxury Mercedes S-Class sedans and B-Class hatchbacks with a safety driver behind the wheel. Details at this link. 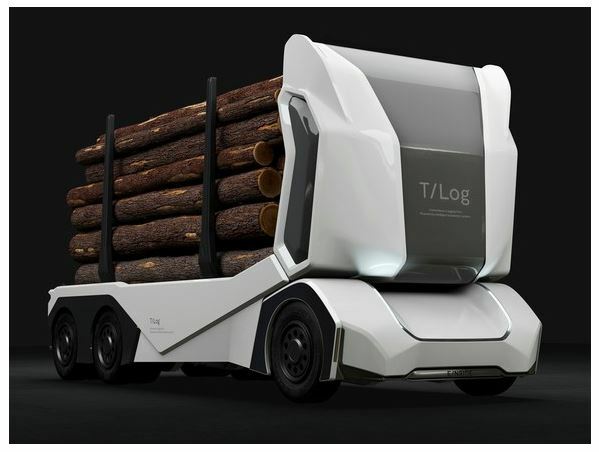 Swedish company Einride has developed an autonomous logging truck dubbed ‘T/Log’ for forestry work. This electrically powered vehicle has a range of 120 miles and can carry more logs due to the elimination of the driver’s cab. It can also be controlled remotely via a remote driver. More information is at this link. On July 10th, the U.S. Secretary of Transportation, Elaine Chao, addressed the annual Automated Vehicles Symposium 2018 in San Francisco (this link). Among other things, she spoke about a US DoT report published in July 2018 titled Public Listening Summit on Automated Vehicle Policy. Link to this 39-page document here. On July 11th, Uber announced layoffs of 100 workers involves in its AV testing programs in Pittsburgh, San Francisco and Toronto. Media reports indicate that Uber slashed the number of autonomous vehicle operators from roughly 400 to 55. This is related to a general slowdown in Uber’s AV testing following the fatality in Tempe, AZ back in March 2018. More information at this link. Aug. 27-30, 2018 IEEE 88th Vehicular Technology Conference (VTC2018) – Chicago, Illinois. Sept. 17-21, 2018 ITS World Congress; Stockholm, Sweden. AV Update is a free, monthly roundup of news and analysis in the world of automated vehicles and their impact on all levels of government and the private sector. 300 Earl Grey Drive, Suite 222, Ottawa ON K2T 1C1, Canada.